Alan Gould is an Australian author with eight novels to his credit, but he is shamefully neglected and his books are hard to find. Back in 1998 when I read his superb fourth novel, Close Ups, (1994) which I’d found remaindered at a book stall, I finished my reading journal with the words: ‘A very beautiful book. I must find more of this man!’ But I didn’t find anything else that he’d written, not ever, not until I stumbled onto the website of small press Finlay Lloyd and discovered The Seaglass Spiral which they published last year (2012). Well, we’ve come a long way since the days when all we had to rely on was a limited number of reviews in the press and on what bookshops chose to promote. Thanks to the internet I have just spent a productive 10 minutes at Brotherhood Books and have ordered To the Burning City (1991) and The Schoonermaster’s Dance (2001) and I’ve got a good chance of tracking down the others in due course too. The intriguing title arises from the union of Susan Ravenglass and Ralf Sebright: the seaglass spiral is a gold filigree helical brooch that holds a micro chip storing their joint family lineage, representing the fine tendrils of character moving down the generations. And Gould’s novel/memoir is also an artfully created kind of family history spiral, drawn partly from family memories but with all the boring bits omitted and the missing bits imagined. It is bookended by a montage of grainy images from a family photo album, and it’s printed on paper that feels slightly aged even though it’s brand new. The cover with its image of a shabby piece of sacking from which the picture of the shell is peeling away, is just perfect for a book that, as the publisher says in the foreword ‘dances between fact and fiction’. There was a fellow called Ralf Sebright. He was decent enough, glad for the most part to be alive, and despite being able to swim, he had just sunk beneath the Pacific Ocean for the second time. Odd to think about this plight really, that a lineage going back to the first caves of kinship might imminently be pinched off. For Ralf had arrived at a moment when he recognised his existence was in trouble. The tale of Ralf and Susan’s families meanders in time and place, curving from his family to hers and back again. As you can see from the excerpt, Gould has a droll, sometimes irreverent style. On the female side a Viking ancestor ‘retires from routine pillaging’ and as he settles down in Northumberland his name transmutes from Hrafnsglas to Ravenglass. But the family with a name derived from place becomes part of the great migrations of empire, and in the aftermath of WW2 Professor Robert Ravenglass of New Zealand, marries Rizká, a Czech widow whose husband and family perished at Theresienstadt. The Sebrights are solid English stock. Thomas fights in the Civil War, and Matthew – suspected but not convicted of foul play – acquires a curse that makes his family always vulnerable to dying out. John marries a gypsy’s daughter and produces a gambler called Romany Jack, but Jack’s offspring is a sober, industrious and ambitious fellow called Jesse. Coming closer to our own time, Mundo is an Oxonian who fought in WW2, and with his Icelandic bride, Unna he fathers Ralf, whose existence – Gould occasionally reminds us – is as vulnerable beneath the waves as indeed all the men of this family have been in their various travails. In the way he presented himself, Jonathan resembled less a Russian realist novel than an Edwardian children’s story. He opened mysterious corridors of himself, led her on, with a secret garden somewhere in prospect’ (p. 210). That’s a great way of putting it, I think. The cunning structure of this book allows this jigsaw of human beings to be gradually revealed as a family. And there is a graceful irony in the way Gould reflects on his own foibles and failings, tracing them to family traits or remaking them uniquely as his own. The lives of these people, whether known to him directly or through family lore, are in some ways humble, and yet in other ways compellingly impressive. In sharing their stories, Gould is asserting that the qualities of courage, humanity, honour, self-sacrifice and humour, are both more common and more special than we tend to acknowledge. See also Peter Pierce’s review at The Age – he admired it too. Or Readings, or direct from Finlay Lloyd. It sounds like a wonderful book. I absolutely love how it begins. I was very sorry to have missed, the other day, the launch of Gould’s latest book of poetry. I had just too much on and had to let one thing go. I love his poem The roof tilers in the Canberra anthology. I have read his book The lake woman which my reading group did a couple of years ago – and Gould attended our meeting. It’s a gorgeous book – and was shortlisted for the Prime Minister’s Literary Award. 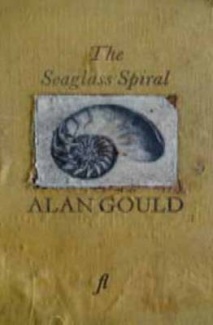 I saw The seaglass spiral last year in the NLA bookshop and so nearly bought it but I knew I wouldn’t get time to read it. I should have. It’s a gorgeous book to hold! I agree re his not being well enough known. Why? He commented to us on how he pretty much has to find a new publisher for each novel he writes. I agree too, that Alan Gould is sadly under-rated. My favourite novel of his is ‘The Tazyrik Year’. Funnily enough, i was just thinking about it yesterday. And he’s a great poet too! Ah, thanks for this, I’ll use Z-Portal to track down the ones I haven’t been able to find at the Brotherhood, and get them on interlibrary loan. The Lakewoman was very memorable. A soldier stuck behind enemy lines, is briefly taken in (and warmed) by a French woman. All set in one day, if I recall correctly. I would definitely read more by him. Hi Angela, great to hear from you – where are you now, is it Finland?